For Buffalo Bisons shortstop Ryan Goins, his first Triple-A season has been all about adjustments. After leading the Eastern League with 158 hits last season with Double-A New Hampshire, the 25-year-old was given the opportunity to try his hand at the Triple-A level in 2013. The hits came for Goins right out of the gate—he had 11 of them in his first 10 games—but zero walks and 13 strikeouts in 16 April games implied some tinkering to his approach was necessary. Goins started making adjustments right away the following month, going 21-for-72 (.292) at the plate with five doubles and two home runs in May. Despite playing in eight more games, his strikeout total was nearly identical to the previous month, and drawing 10 walks delivered a boost to his on-base percentage. 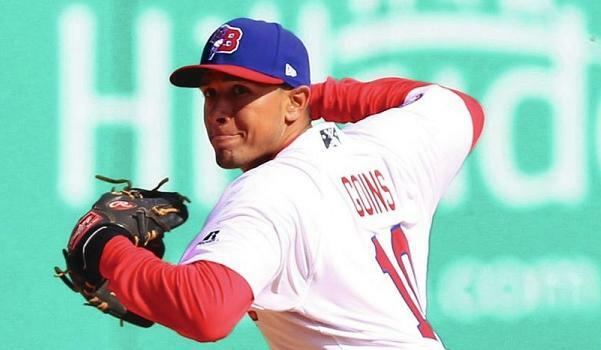 Part of the reason of the turnaround was Goins’ good rapport with Bisons hitting coach Jon Nunnally, who worked with the shortstop all of last season in New Hampshire as well. “That’s been great, having a guy that I’m comfortable with working with me every day in the cage,” Goins said of working with Nunnally again. Having spent parts of six seasons in the majors and nine of his 12 minor league campaigns at the Triple-A level, Nunnally has helped Goins with more than just hitting. Goins continued to roll in June, hitting .292 once again (26-for-89) with seven doubles, one home run, nine walks and 15 RBI. He currently sits second on the Bisons with 21 doubles and is tied for third with 85 hits. To his hitting coach, Goins just needs to trust his talent and continue to capitalize when he gets pitches to hit. “Just staying confident in his ability and what he does, that’s the main thing,” Nunnally said. “They’re going to give you a pitch; understand what the pitchers are trying to do. His plan of attack has got to fall into that. But there’s a lot more to Goins’ game than just hitting. On the other side of the ball, the Round Rock, Texas native has continued to play above-average defense for the Bisons. Including the five games he’s played at second base, his 276 assists lead the team by a wide margin, and he’s on pace to set a new career high in that category as well. But it’s often his plays that don’t show up on the box score that particularly stand out. Goins might be closer to the big leagues than he’s ever been, but he’s not letting that get into his head and change the way he approaches the game every day. “My goal for the whole season is just to play as well as I can, put together the best year possible,” he said. “If that means getting the call to the big leagues at some point, that’s awesome, but I’m not going to put this stress on myself that I need to be in the big leagues.